To those working at the Suters store in Uxbridge change came gradually. Hilda Browne left school at the age of 14 in 1940. She lived with her parents at 60 Chiltern View Road just off the Cowley Road in Uxbridge and attended St. Andrews Girls School. 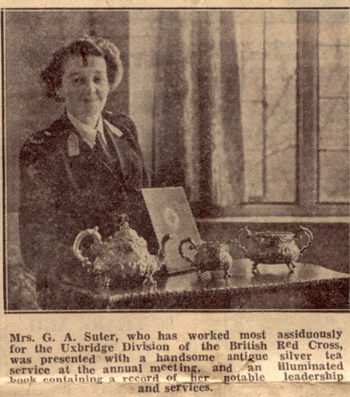 During her final year she mentioned she was interested in office work and her Headmistress gave her a letter of introduction to Arthur Suter who managed the Suters Uxbridge store. When Hilda started, the routine of life in the Uxbridge store was substantially unchanged from that existing before the war. She remembers Saturday evenings, when at the end of a long day and with the store due to close at 9.00 p.m., 'the Governor', George William Suter, would stroll up and down just outside the High Street entrance, in a frock coat with his hands behind his back, assuring passing shoppers that 'the store is still open'. All the girls inside wanted to do, was to close up and go home! 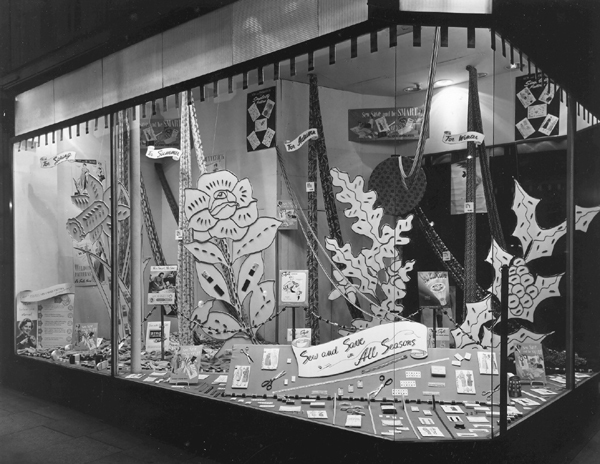 The front windows of the store were always 'dressed' so as to display ladies fashions and school wear. If the day started wet the window dressers quickly added mackintoshes, raincoats and umbrellas to the display and ensured that some of the umbrellas were displayed 'open'. The idea was to boost sales! Hilda also remembers how change for a purchase at say eleven pence three farthings was given in the form of a packet of pins instead of a farthing coin. Hilda began work at a weekly wage of 7s. 6d. (£0.37½p) with one week's paid holiday a year. She gave her mother 5s. 0d. out of her wage packet each week and kept the other 2s.6d. on the understanding that she would buy her own stockings. 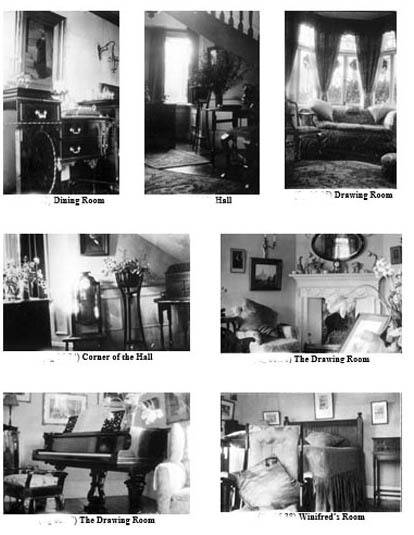 She worked a 46¼ hour week and was placed in the 'Lamson room' on the top floor. In a pre-computer age the efficient and secure control of cash prompted some ingenious devices. Payments were made in cash, by cheque or charged to an account. There was no such thing as a credit card though one alternative form of payment did involve a card of sorts. Part time 'agents' were encouraged to organise a 'club' amongst their friends and acquaintances. Members deposited small sums with Suters through the agent and these were recorded on a card and could later be 'cashed' in exchange for goods. Later, 'stamps' replaced the 'cards' in the scheme. Sheets of stamps, each denominated at one shilling, were issued to the agents for sale to club members. When presented at the counter a sales assistant would cut off the appropriate number in payment for the purchase. 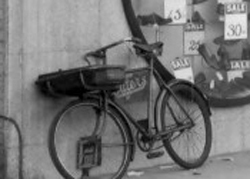 Another method of promoting sales was by a representative mounted on a roving bicycle. Mr Thomas had the task of covering the Chalfonts, Gerrards Cross, Harefield and Rickmansworth. He visited customers took their orders for say curtain material, measure up and return on another day with the material. The goods were supplied on credit and paid for at so much a week. A similar scheme applied at the Slough store. 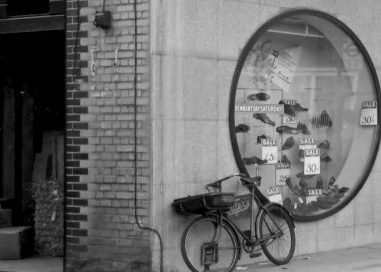 By arrangement with Slough Estates, a representative would cycle around the Trading Estate and take orders for cutlery, linen, china and other goods. There was a similar scheme with Eton College. All goods would be supplied on account. 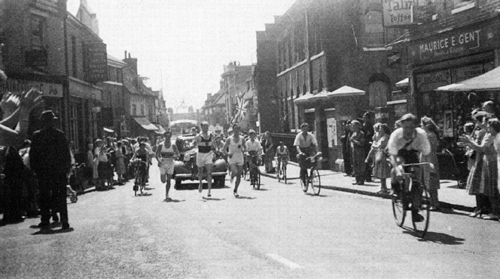 Local deliveries from the Uxbridge store were made by Charlie Aldin on a bicycle with a big basket on the front (photo above left). He delivered the small items such as three or four yards of elastic needed urgently to repair some domestic crisis or other around the town. As the war progressed staff began to disappear and those, like Hilda, who remained, moved to fill the vacant places - in her case to a desk in the general accounts room. It was no coincidence that the move came in the early part of 1942. By the autumn of the previous year, it had become obvious to Churchill's government that if the country was to wage total war the available 'man-power' must be 'directed' to where it could make the most effective contribution to the war effort. Ernest Bevin who was Minister of Labour and National Service and the Lord President of the Council, Sir John Anderson, together, devised a scheme for the transfer of people from 'less essential occupations' to those deemed 'more essential'. The scheme was the equivalent on the 'Home Front' of conscription for military service. As the reservoir of available 'man-power' reduced so all 'non essential' demands had to be cut and more and more men and women were directed to new kinds of work. Like all retail businesses Suters began to suffer losses of staff from conscription or direction to war work. Amongst those who disappeared in 1941 was Frank Suter. He received a 'call up notice' at the age of 40 and departed for the army. Mr Neville also left to join the army. He served with the army in Malaya and was taken prisoner by the Japanese. He had a bad time in Chiangi jail. John Suter received his call up papers in 1942 and was drafted into the RAF. Hilda Browne was much younger than either Frank or John and on reaching age 18 in 1943 became liable to assignment. She was given three choices; to serve as a non combatant in the forces either as a driver or clerk, to join the 'land army' and work on a farm or to train as a nurse. 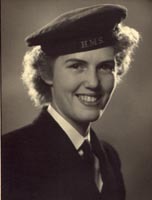 She opted for nursing and served at a Heatherwood Hospital in Ascot until 1948. 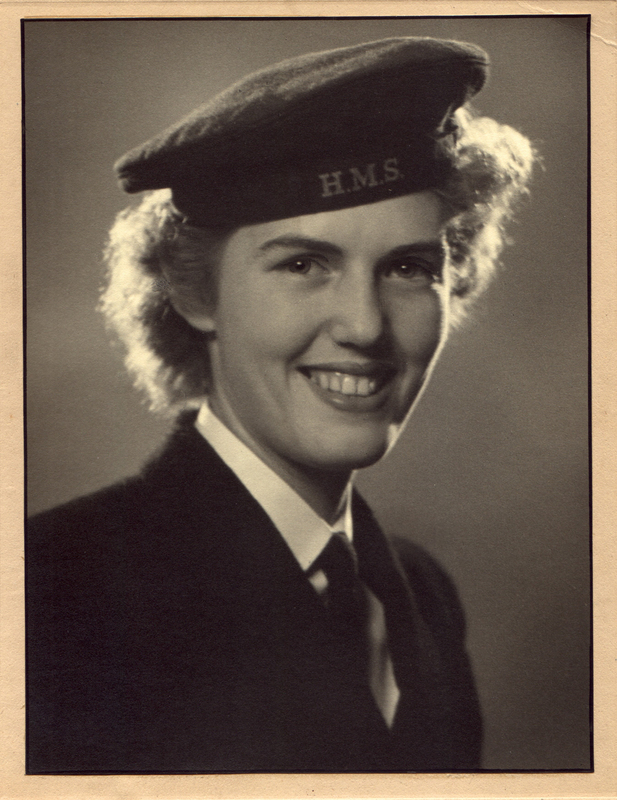 Arthur's daughter Elizabeth ('Su') joined the WRNS, though not until 1944. Until then she was a frequent holiday worker in the accounts room together with her sister Ruth. She remembers Mr Neede who wrote up the books in a beautiful hand. 'Su', who was developing into an artist, appreciated the skill he employed while she occupied herself sticking receipts onto spikes, taking care not to spike herself in the process! As well as staff, many types of goods began to vanish from the shelves behind the counters. As consumer production was cut, household items, normally taken for granted, became scarce. Combs, soap, cosmetics, hair-grips, elastic, buttons and zips - all became virtually impossible to buy as the factories which had once produced them turned over to war work. Silk or nylon stockings - women did not then wear tights - were difficult to find though they were freely available, together with almost everything else, on the other side of the Atlantic. As time went by a 'black market' developed in scarce and easily portable items - though many people would have nothing to do with it - and when American servicemen appeared, from 1943 onwards, nylon stockings returned with them. For Suters, supply difficulties made more work but, also, created opportunities when it came to buying stock. Clarence Suter in Slough organised buying visits to manufacturers who only had small quantities to sell and was prepared, at times, to accept partially finished garments which could be brought back and completed in Slough. 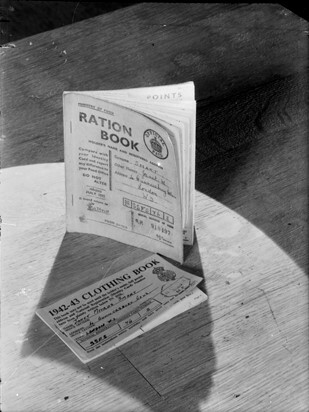 While food rationing came early in 1940, prompted by losses of shipping and goods at sea, the rationing of clothes followed in June 1941 as a consequence of the switch in production. At first, everyone was issued with 48 coupons per year. Eleven coupons authorised purchase of a dress and sixteen were needed for a coat. The number of coupons was later (1943) reduced to 20 per person per year. People saved material where they could. As a result, skirts became shorter and pleats were definitely 'out'! Mothers, like 'Bobbie' Suter and the volunteers dragooned into the service of the 'Comforts' fund, became expert knitters and adept at re-using wool from old garments. The art of knitting was taught, as a matter of course before the war by mothers to daughters and the daughters now sharpened their skills in a time of adversity. Many were already skilled dress makers and found ingenious ways around the regulations. Materials could be re-used or used for a purpose for which they were not originally intended. Cheap material - sometimes even blackout material - could be embroidered or decorated with smocking and made into blouses or skirts. The papers had great fun with cartoons showing silly ladies who had turned curtains into coats. The Ministry of Information did its best to show that a pretty dress need cost no more than seven coupons. Clothing coupons could be exchanged freely at any shop where clothes were sold. It was impractical to limit people to particular suppliers. The same was not true of food where each householder registered at a particular butcher for meat, at the dairy for milk and at a grocer for other food. Some exotic fruits disappeared altogether. After the war there were children aged nine or ten who could not remember ever seeing a banana. There were generous people on the other side of the Atlantic and some sent food parcels and presents to friends and relatives in Britain. These increased after the United States entered the war in 1942 and some British servicemen, like John Suter, were posted to the 'States'. John sent presents home to his family but when Bobbie asked him to buy her some foundation cream she received a stiff note from the censor telling her that she must never ask for food. Presumably he was unmarried! John did send, unsolicited food from time to time though when packets of 'Frizz' - ice-cream powder - arrived in midwinter when Bobbie was short of coal, she was not immediately quite as appreciative as she might have been. However, the children enjoyed the Frizz when it was made up - Dicks Suter still describes it as 'nectar'. But it would be wrong to think that all was gloom and doom. Hitler was the enemy and almost any inconvenience was accepted and cheerfully blamed on him - 'don't you know there's a war on!' Everyone knew why factories needed to produce armaments not 'buttons and zips'. During War Weapons Week in 1941 Suters Slough store 'decorated' it's main entrance with a model of a destroyer, 35 feet long. (above left and below left) The aim was to raise enough money to pay for a destroyer. The target was £500,000 and over a million was raised before the appeal closed. In Slough production of the Trading Estate was increasingly dominated by armaments. Also, at Langley, Hawker Aircraft expended its aircraft production and by 1942 was producing five planes a day. The factory necessarily maintained a small airfield and there was always a Hurricane ready to scramble in the event of a raid. Staff shortages at Slough led to Tom and David Suter plus their mother, Maud, being "volunteered" as additional temporary shop assistants during the school holidays. Over in Uxbridge there was not a great deal of armaments production but funds were raised to pay for munitions and the town raised £320,000 in order to adopt the destroyer H.M.S. Intrepid. Money was raised to pay part of her cost and 'comforts' were sent to the sailors on board. Arthur was actively involved in the appeal both as a District Warden and at Suters. There was also a campaign to 'adopt' a Spitfire. The Ministry of Home Security issued guidance to local authorities regarding the arrangements to be put in place for detecting and combating outbreaks of fire caused by enemy attack. The 'Fire Guard' involved joint action by the Fire Service, Police, Wardens and fire watchers stationed at night on all business premises. An essential feature was the creation of a communications system which would withstand disruption caused by raids. At the Suters Uxbridge store staff were called upon to give up free time to 'fire watching'. Hilda Browne (above left in 1942 standing on the roof of the Suters Uxbridge store.) remembers this in the early days when there 'were still a few men around'. She gave up every Wednesday afternoon (it was 'early closing day') and all day on Sunday. She quite enjoyed it as, generally, not a lot happened and she received an extra 1s. 6d. for the time. 'Fire watchers' were based on the top floor of the building. Two camp beds were provided for night time watchers and watchers were able to use the 'Senior Staff Room' to make hot drinks. Later in the war Hilda also did 'watching' at night. Fortunately, while bombs fell on Uxbridge, 'Suters' remained undamaged throughout the war. Just as staff gave up time to watch for fire and air raid damage to the store so particular care was required to safeguard financial records. The firm's ledgers were taken down to a safe in the basement which projected out under the High Street. After Papa [John] went to New York, our food supplies gradually became more varied and of better quality. He sent us food parcels containing such delicacies as 'Hormel Ham' - not bad at all! 'Frizz' powder ice-cream, which today might taste poor but then it was like food for the gods - especially when Papa [John] sent some pots of maple syrup, after being in Canada on a 'refresher course'. This was all additional to our general rations, which included bullied beef, powdered eggs, powdered tomatoes, 'spam', and cod liver oil. We also grew some vegetables in the garden such as carrots, beans, peas and potatoes. We had some fruit trees and bushes too. By the time Arthur Suter was able to resume attending the 'Comforts Fund' meetings the organisation had grown in response to the demands of the war. A Welfare Committee had been added in February 1940 and, during the next three years, 2,800 families were visited and 712 cases of distress assisted at a cost of £1,637.14s.8d. A report made in December 1942 confirmed that in the previous twelve months 32 grants had been made to families in Uxbridge, 218 in Hillingdon, 5 in Ickenham, 5 in Cowley and 13 in Harefield. The main expenditure was on footwear for children and extra food during illness and confinements, also dental treatment and money to cover travelling expenses for attending hospital. 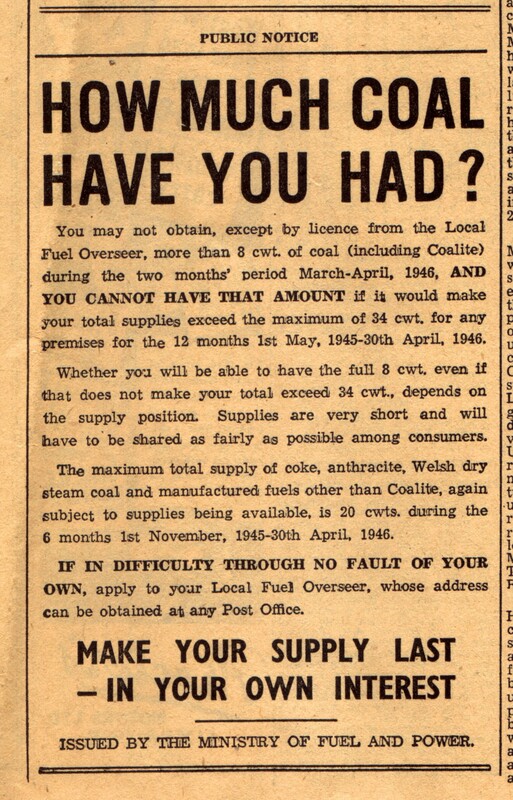 'Comforts' parcels were, still, dispatched to the troops - 2,896 during the twelve months to December 1942 - but a new committee was dealing with parcels for Prisoners of War. In January 1943 Dorothy Suter, on behalf of the British Red Cross Society, proposed a party for 300 children of prisoners of war and serving soldiers to be held in the Drill Hall on the 23rd January. It was agreed that the cost would be divided equally between The British Red Cross and the Prisoners of War Parcels Committee. However, at the next meeting, Dorothy confirmed that while 280 children had attended there would be no expense to the committee as donations covered all the costs involved. 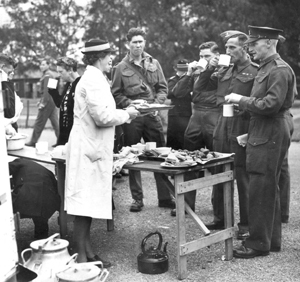 In addition to the Services Canteen, a Services Hostel was up and running by December 1943. The minutes of the Executive Committee meeting of the 6th April 1944 recorded that 284 service men had stayed there during the month of March. Arthur resumed his position as Chairman of the Library Committee and, on the 3rd June 1943, reported that books were being sent to both Harefield Hospital and to H.M.S. Intrepid - the destroyer 'adopted' by Uxbridge earlier in the war. He, also, acquired two new jobs during the summer. In about June 1943 he was either co-opted or elected to the Urban District Council and is described as 'Councillor' Suter in the minutes from the July meeting onwards. He also took over as Secretary of the Fund when both the Secretary and Assistant Secretary were forced to retire in September, the former on grounds of ill-health and the latter following 'call up'. Thereafter, Arthur continued as Secretary until the Fund was wound up in 1956. Dorothy was active on the Prisoners of War 'Comforts' Committee and a report made to the main Executive in January 1944 gives an idea of its activities: Mrs Suter presented the report of the Prisoners of War Parcels Committee stating that during the last month 17 "Next of Kin" and 25 supplementary parcels of cigarettes and tobacco and 5 parcels of playing cards had been dispatched at a cost of £20.6s.0d. A letter was read from prisoner of war Chapman expressing his thanks for parcels received. The assistance of the press was asked to enable the committee to trace Mr Sam Wiseman. It was reported that news of the arrival of three more prisoners of war from Italy to Germany had been received. One prisoner of war had arrived in Switzerland and a Mr Watson of Hillingdon had regained Allied lines and eventually Scotland. Dorothy was, also, working with the sick and wounded at the RAF Hospital and at the hospitals at both Hillingdon and Harefield. 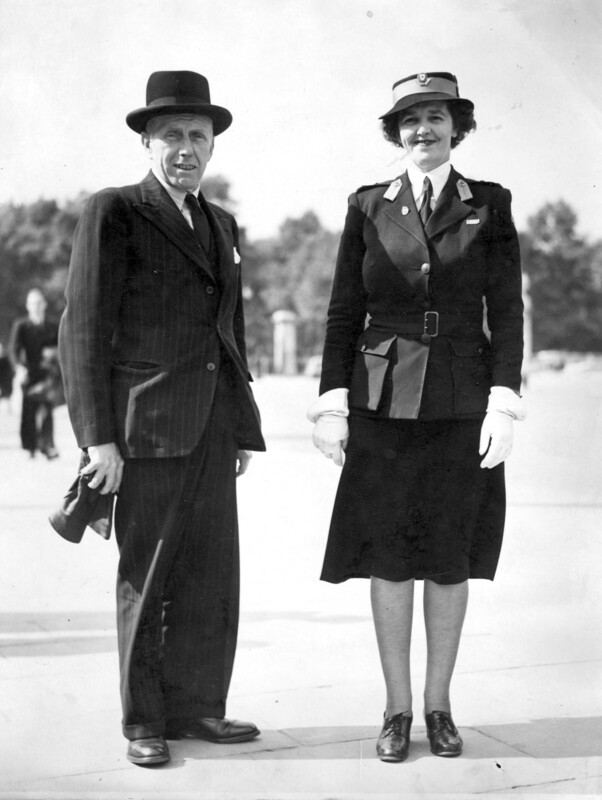 As Divisional Secretary of the British Red Cross Society she was involved with Mrs Lovibond in the organisation of an "All-Star Concert" in the Regal Cinema Uxbridge to raise money for an ambulance for the Uxbridge district. 1,700 people attended. Arthur preserved an undated press cutting which from the other news items seems to have been taken from a paper towards the end of the war. VE Day marking the end of the war in Europe was celebrated on the 8th May 1945. While the end of the war brought celebrations there was no mini-boom and Christmas spending spree of the kind which followed the Armistice in 1918. 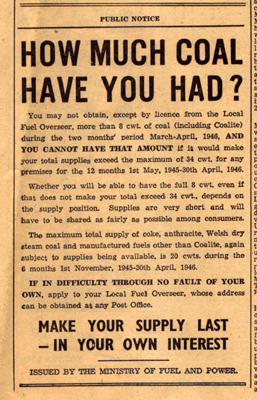 Rationing continued and goods were in very short supply even if you had the necessary 'coupons'. 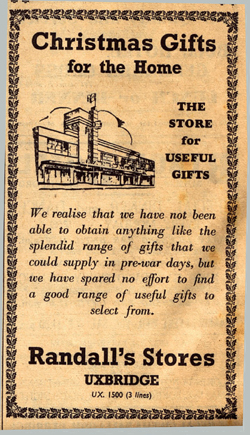 The Christmas advertisement for Randall's Stores in the Middlesex Advertiser on the 14th December 1945 apologised for not being able "to obtain anything like the splendid range of gifts that we could supply in pre-war days"
Randall's in Uxbridge must, certainly, have scored points for honesty with such an advertisement! A few weeks before Randall's placed their advertisement, Suters in Slough received absolutely free publicity in Daily Mirror news story just a month earlier. 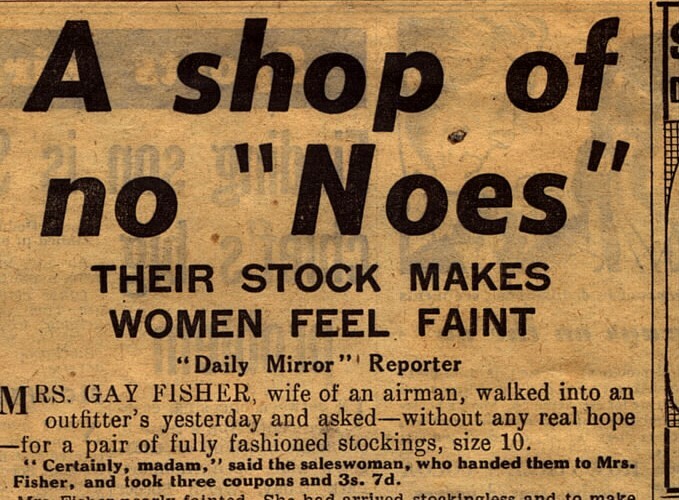 "A shop of no 'Noes' - Their stock makes women feel faint". Mrs Gay Fisher, wife of an airman, walked into an outfitter's yesterday and asked - without any real hope- for a pair of fully fashioned stockings, size 10. "Certainly, madam", said the saleswoman, who handed them to Mrs Fisher, and took 3 coupons and 3s.7d. Mrs Fisher nearly fainted. She arrived stockingless and to make sure she wasn't dreaming she put the stockings on in the shop and walked home in them. Next door in the men's department of this shop in Wellington street, Slough Bucks, men were buying trilby hats, pre-war bowlers, rain-coats - everything that men cannot seem to buy. In the women's wear department I saw shelves packed with georgette blouses, Curlaska coats, fabric coats, spun shirting and jumpers. A counter hand walked through the shop with an armful of blankets, another followed with sheets, but shoppers did not rush them, although the shop was packed. I have never seen a store filled with so man 'unobtainable' garment. "There is no magic about it said Mr Clarence Suter, one of the directors. We have men all over the country, always ready to buy up everything no matter how small a quantity. We go to Birmingham for raincoats, to Manchester for sheets, Leeds for dress materials and last week I was in Taunton buying shirts. We buy big quantities of garments which are not completely finished by the manufacturers and finish them here. Sometimes a buyer comes back with only three pairs of shoes or six dresses, quantities that multiple shops would not consider, but that is how we keep a big stock. We have no under the counter business - every buyer must buy out in the open." 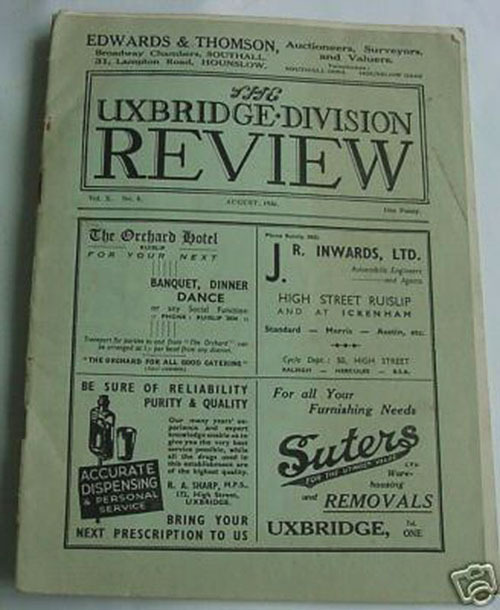 and the achievements of the Uxbridge Red Cross were described at the annual meeting held in April 1946 when Dorothy Suter as Secretary of the Uxbridge Division delivered her report: ….Our adult members are actively engaged in hospital work, canteens, libraries, blood transfusion, first aid duties at cinemas and outdoor functions, and diversional therapy. Our youth and junior members (of which we have 150 cadets) are engaged in many spheres. At Ferndale Hostel we are just completing our second year of service to the relatives visiting patients in Harefield, Hillingdon, the RAF and Mount Vernon hospitals. Our Library Service is now well established; at Harefield. We issue to the patients about 800 books a week. The soldiers comforts are still well looked after. The men only have to express a desire, and where it is humanly possible, their request is granted. The mobile canteen had covered many miles since the last report, and had gained "world-wide" fame. 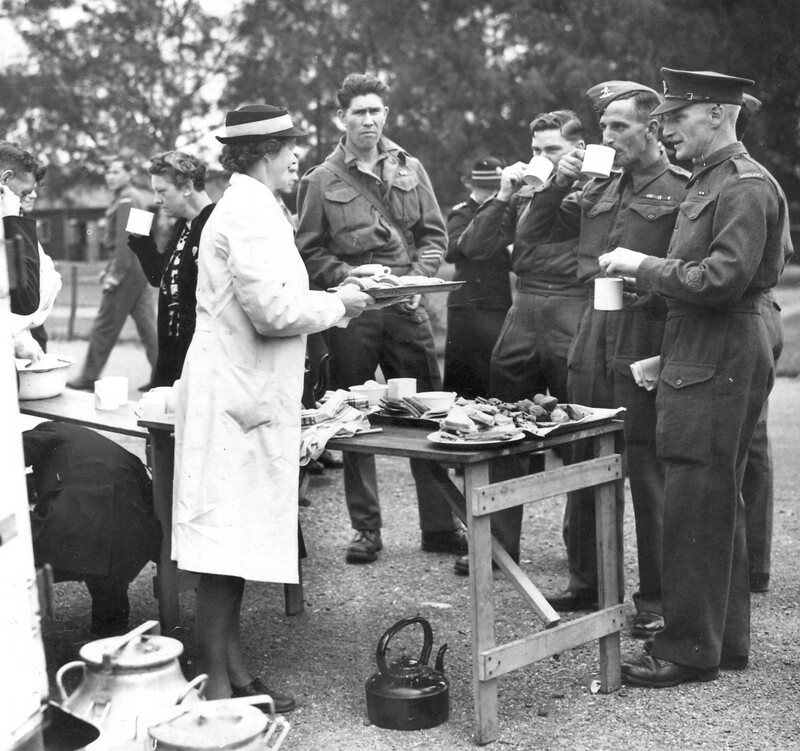 During the past year 64,584 cups of tea and 41,000 meals had been served and many thousands of cigarettes and slabs of chocolate distributed to repatriated prisoner-of-war and wounded men from ambulance trains at the London termini and at Epsom. It was a great joy to us to be chosen by Headquarters to meet liners loaded with repatriated prisoners and internees at Southampton docks in December last and again this month. …the canteen service to Hillingdon Hospital three times a week continued. One part of the work that had greatly increased was welfare. This was done at the request of Headquarters and the hospital almoners, and over 200 ex-servicemen had been visited. 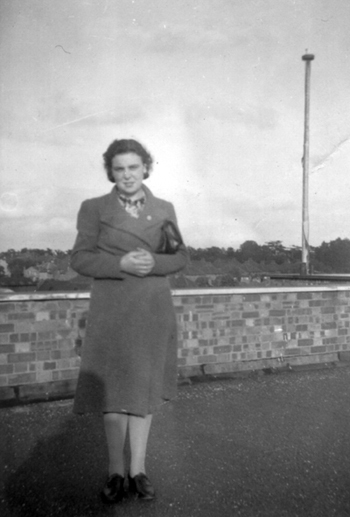 During the repatriation of prisoners of war from the Far East, many of our friends put their cars at our disposal, and between us we did well over 1,000 miles carrying the men and relatives from the London stations to their homes in places as far apart as Croydon and High Wycombe…..
Dorothy had been awarded the Distinguished Service Certificate of the Red Cross Society and, after delivering her report, she was also presented with an illuminated book and an antique silver tea set. Arthur Suter's war service in Uxbridge was recognised in December 1945 when he was elected Chairman of the Uxbridge conservatives and, in the following April 1946, when he was one of five members of the old council re-elected to the Uxbridge UDC in the Hillingdon West ward. Mr W.G. Pomeroy who had been Chairman of the old council and also of the 'Comforts Fund' headed the list with 1,699 votes. 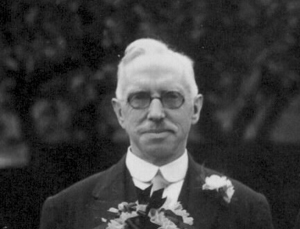 Arthur Suter came third with 1,512 votes. Labour secured a 14-12 overall majority on the council. The retiring council 'celebrated' the end of an eventful eight years with a dinner in the Regal Restaurant. Wives were present and Dorothy Suter responded to the toast of "the wives and other relatives". At the beginning of January 1946 the Suters department stores in Uxbridge and Slough were short of directors, short of staff and like most other retailers, short of stock. Shortages were real and affected the most basic of commodities. The rationing of both food and clothing had been introduced during the early years of the war and in May 1945 the normal adult food ration for a week consisted of 8 ounces (227 grams) sugar, 4 ounces preserves, 8 ounces fats, 2 ounces cheese, 4 ounces bacon, 2 ounces tea, 2 pints milk and 1 egg. In addition an adult was entitled to choose 6 "points" worth of extra nourishment from a long list where 6 points brought just over a third of a pound (about one seventh of a kilo) of meat or tinned fish or dried fruits or a pound and a half of tinned soup, tinned or bottled fruit or vegetables, biscuits, oatmeal, dried pees or beans, macaroni or spaghetti. Alternatively 6 points would also bring 3 pounds of rice, sago, tapioca or semolina or 2 pounds of tinned peas or beans. Chocolates and sweets were subject to a separate system of rationing where 16 personal points brought one pound of sweets or chocolates and a week's allowance was three points.Rationing continued for several years after the war and the allowances were reduced before they became more generous. 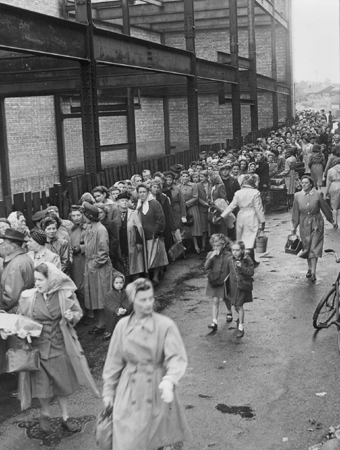 By the time John Suter was boarding ship in New York to return to his family Bobbie Suter was having to cope with rations which had been reduced in February to allow for the release of supplies to the British Zone in Germany and Bread rationing which was introduced for the first time at the end of May 1946 not having been rationed at all during the war. The Middlesex Advertiser of Friday April 5, 1946 contained a "Food Facts" advertisement cautioning against the waste of bread and cautionary posters were also displayed in cafes. The rationing rules took some understanding. An advertisement in the Slough Observer on the 19th July 1946 describes changes in the rules following the introduction of bread rationing. Bobbie Suter also, doubtless, groaned and cursed Mr Shinwell when he warned in July that there were insufficient stocks of coal to get through the winter. Just in case she did not treat the matter seriously, the Advertiser, in April, contained a stern warning against excessive use of coal. 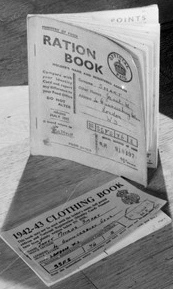 The rationing of clothes had been introduced in June 1941. At first, everyone was issued with 48 coupons per year. Eleven coupons authorised purchase of a dress and sixteen were needed for a coat. 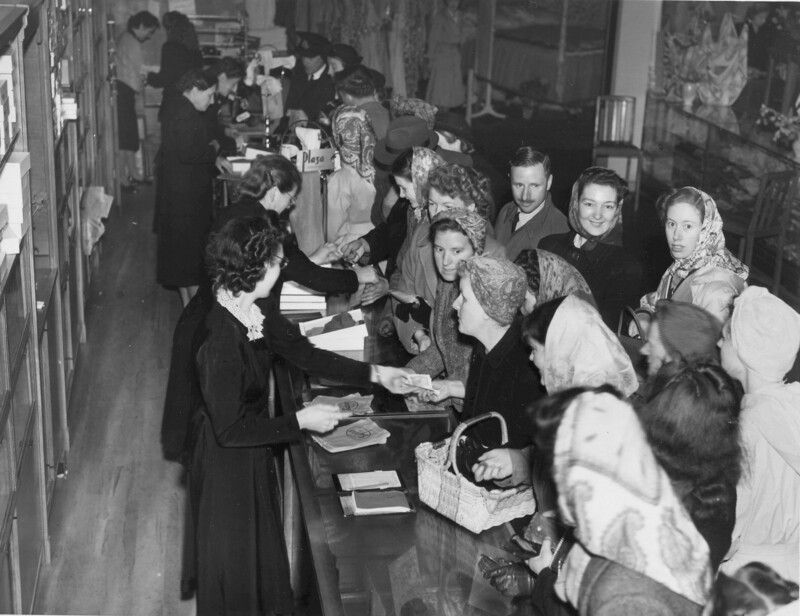 The number of coupons was reduced to 20 per person per year in 1943. People saved material where they could. As a result, skirts became shorter and pleats were definitely 'out'! 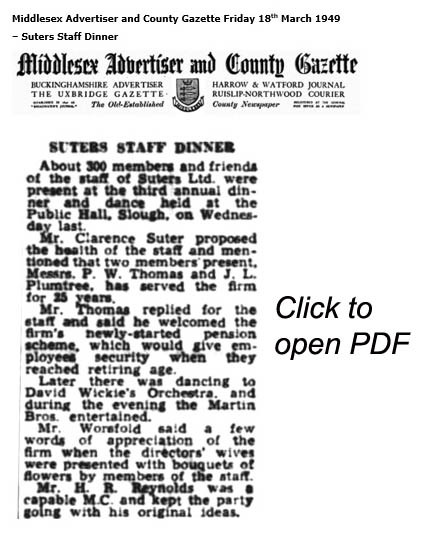 It was some months before Suters directors and staff began to return from the war. "Retail" did not rank as a high priority when men applied for early discharge. Many former staff were in the services or in other war time occupations classified as "essential". Hilda Browne did not return from nursing to the accounts department at Uxbridge until 1948. The stores continued to be directed by George William Suter now aged 79 with the help of his sons Arthur (based at Uxbridge) and Clarence (based at Slough) who had fought in the First War and were not required for active service in the Second. In January 1946, Frank Suter was with the army in Italy and John Suter was with the RAF Embarkation Unit in New York. As Suters staff returned at the end of the war they found that familiar working conditions were changing, if slowly. When Hilda Browne was released from nursing in 1948 and came back to the accounts department in Uxbridge at the age of 22 she received a weekly wage of £2 - more than five times her starting figure in 1940 when she was just 14. She was also called upon to work a 37 hour week - 10 hours less than in 1940. Her paid holiday entitlement had doubled to two weeks instead of one. The changes noticed by people working in the store reflected the change in employment conditions generally. These accompanied and were part of the political and social changes discussed within Churchill's government during the war and implemented and elaborated by the post war Labour government elected in 1945. The two Suter brothers who had been 'called up' were released from the services and returned to the company in 1946. Immediate questions facing the board included the plans deferred in 1939 to redevelop in Slough and create a large store similar to or even larger than the one opened in Uxbridge in 1938. There were also works outstanding from the redevelopment of Uxbridge and while the Suter appetite for expansion was undiminished future proposals had to be considered in country refilled with optimism but woefully short of money and tangled in a web of restrictions and shortages. "In 1946 Frank and John returned to the business and thoughts of expansion were once more uppermost in the minds of the five directors. A shop of no 'Noes' - Their stock makes women feel faint". Mrs Gay Fisher, wife of an airman, walked into an outfitter's yesterday and asked - without any real hope- for a pair of fully fashioned stockings, size 10. "Certainly, madam", said the saleswoman, who handed them to Mrs Fisher, and took 3 coupons and 3s.7d. Mrs Fisher nearly fainted. She arrived stockingless and to make sure she wasn't dreaming she put the stockings on in the shop and walked home in them. Next door in the men's department of this shop in Wellington street, Slough Bucks, men were buying trilby hats, pre-war bowlers, rain-coats - everything that men cannot seem to buy. In the women's wear department I saw shelves packed with georgette blouses, Curlaska coats, fabric coats, spun shirting and jumpers. A counter hand walked through the shop with an armful of blankets, another followed with sheets, but shoppers did not rush them, although the shop was packed. I have never seen a store filled with so man 'unobtainable' garments. In addition to running the Uxbridge store, Arthur Suter continued active in the Uxbridge UDC and had been elected Chairman of the Uxbridge conservatives in December 1945. In April 1946 he was one of five members of the old council re-elected to the Uxbridge UDC in the Hillingdon West ward. Mr W.G. Pomeroy who had been Chairman of the old council and also of the 'Comforts Fund' headed the list with 1,699 votes. Arthur Suter came third with 1,512 votes. Labour secured a 14-12 overall majority on the council. The retiring council 'celebrated' the end of an eventful eight years with a dinner in the Regal Restaurant. Wives were present and Dorothy Suter responded to the toast of "the wives and other relatives". According to the Uxbridge UDC Year Book, during the year 1946-47 the Council Chairman was Leonard James Reynolds J.P. and the Vice-Chairman was Sarah Hannah Dubberley. Council Meetings took place on the last Wednesday in each month at 7 p.m. There were 26 council members and George Arthur Suter was one of 7 councillors for the Hillingdon West Ward. All councillors were due to retire in 1949. His address is given as "Krithia", Norfolk Road, Uxbridge and the phone number Uxbridge 1620. Arthur was a member of the Allotments Committee, Finance and General Purposes Committee, Housing Committee, Parks and Open Spaces Committee, Public Health Committee, the Rating and Valuation Committee and the Local Safety Committee. He was not included in the list of magistrates. ….Our adult members are actively engaged in hospital work, canteens, libraries, blood transfusion, first aid duties at cinemas and outdoor functions, and diversional therapy. Our youth and junior members (of which we have 150 cadets) are engaged in many spheres. George William adopted an unsentimental approach when it came to houses. 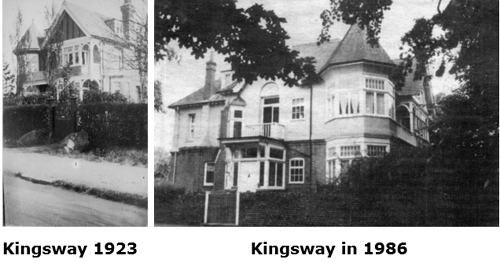 Just as 'Bank House' in Ledbury had been given up for the smaller 'West View' as soon as the elder children started to leave home and start their apprenticeships so 'Kingsway' was taken on when a larger house was needed again in 1923. 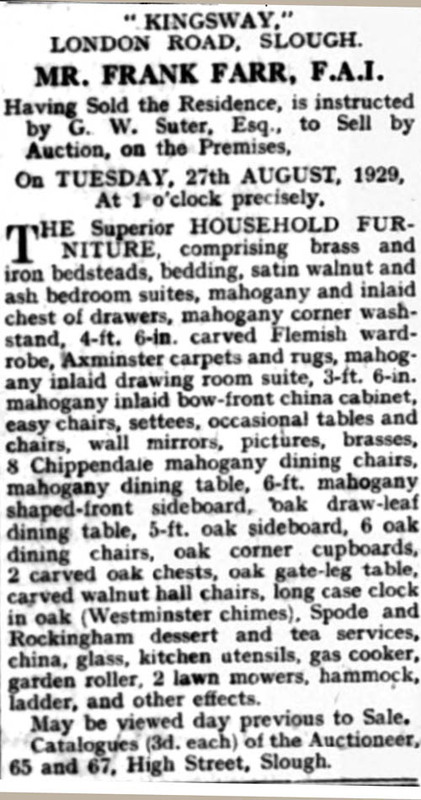 Now, in 1928, the need had passed and George William decided that it was time to sell. George William outlived his first wife, Elizabeth Fisher, by nearly nine years. He continued to live in 'Bilby House' supported by a succession of housekeepers. While he seemed to have retired in 1918, the second shop opened with Clarence in Slough, which, so far as George William was concerned, may have been an exercise in semi-retirement, had been developed by Clarence and his brothers into a major family business. It become the centre of George William's life. Then seemingly settled as 'head' of a successful company and the grandfather of an ever expanding brood of children, George William provided his family with an unwelcome surprise and, in 1942 at the age of 75, married his housekeeper, Bertha Locking. The marriage of a father and grandfather in his mid seventies, to a housekeeper, be she ever so kind and ever so good, is rarely popular with the family. Children just do not expect a parent to be thinking of that sort of thing at that sort of age. The Suter family was no exception to the rule and their reaction to Bertha was made more intense by real worries for the future of the Suters company. George William was a major shareholder and the company's policy hitherto had been to take out the net profits in the form of director's salaries subject to provision for future investment and expansion. Ordinary Shareholders could expect capital appreciation in the long term and a very small annual dividend. The arrangement worked well while the business remained a close knit family affair but if Bertha acquired a block of shares there could be problems. Any will previously made by George William was automatically revoked on his second marriage. There may have been conversations between George William and his sons but concern remained as to how far the financial obligations to Bertha arising on George William's death would affect the company. George William Suter was taken ill during the summer of 1946 and died in the King Edward VII Hospital, Windsor on the 13th July 1946 aged 79. "A business-man died in Slough this week who for more than a quarter of a century was almost daily the first to arrive at his shop - and usually the last to leave.Retiring from business in 1918, he was unable to reconcile retirement with his previous active life, and, in 1920, he started again. He saw his new firm grow from 16 to 120 employees. 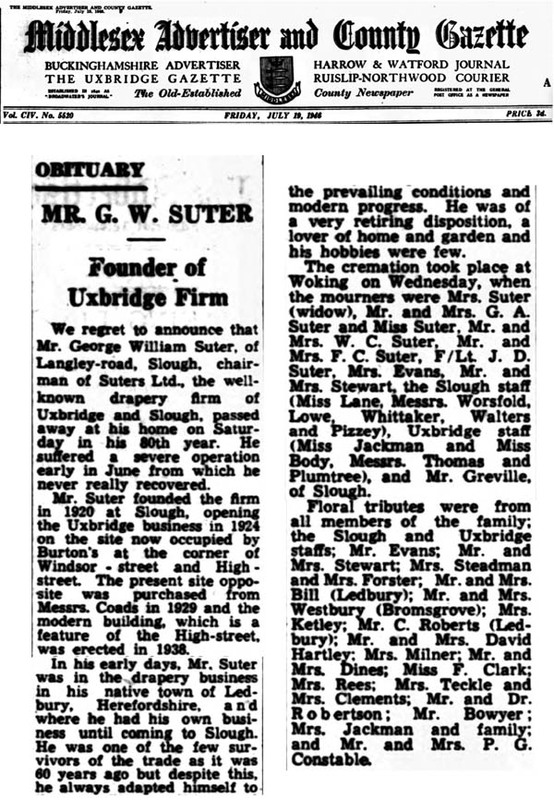 He was Mr George William Suter, chairman of Suters Ltd., the Slough and Uxbridge drapery and outfitting firm, who died in Windsor hospital on Saturday afternoon, in his 80th year. Although he kept himself fully abreast of the town's development, Mr Suter never took an active part in the public life of Slough. His motto was "Stick to the business and the business will stick to you." In fact he took rather a poor view of business men who "dabble in local affairs and often neglect their own businesses." "It doesn't do," he often told one of his sons, Mr Clarence Suter. Born at Ledbury in Herefordshire, Mr Suter succeeded his father in his drapery business, and built up a prosperous concern, which he eventually sold in 1918. For two years he lived in retirement but in September 1920, with Mr Clarence Suter as his partner, he bought the old-established Slough drapery firm of Messrs J Andrews and Son at 101 and 103 High Street Slough. Soon Suters became a household name in the district. Three years later they took over an adjoining concern, Messrs Blanchetts at 99 High Street. In 1924, still with an ambition to extend, Mr Suter purchased a prominent drapery house at Uxbridge, Messrs Carrick and Coles, and his three other sons joined the business. In 1929 yet another Uxbridge store - Coads - was absorbed into the business. In 1936 Mr Suter sold his first Uxbridge purchase - Carrick and Coles - and concentrated entirely on Coads which was modernised. In 1940 the Slough men's wear firm of Hopkins was added to the firm. Even up to the time of his illness - the first he had ever had - which started six weeks ago and necessitated his immediate removal to hospital, Mrs Suter was still planning and thinking in terms of big post-war development. During the first world war he served in the Ledbury Volunteers - known locally as "the grandpa boys." In Slough he was a vice-president of the Slough Cricket and Bowls club. He is survived by his four sons and one daughter. The funeral was at Woking Crematorium on Wednesday. The family mourners were: Mrs Suter (widow), Mr G.A. Suter, Mr W.C. Suter, Mr F.C. Suter and Mr J.D. Suter (sons), Mrs N. Moon (daughter), Mrs G.A. Suter, Mrs W.C. Suter and Mrs F.C. Suter (daughters-in-law), Miss Elizabeth Suter (grand-daughter), Mrs Evans (sister-in-law), Mrs Stewart (niece) and Mr Stewart. Members of the Slough branch present were: Mr H. Worsfold, Mr Lowe, Mr Pizzey, Mr Whittaker, Mr Walter and Miss Lane. Representatives from the Uxbridge branch were: Mr Thomas, Mr Plumtree, Miss Jackman, Miss Body. Floral tokens were sent by: Eugenie and Colin, Dorothy and Arthur and family; Clarence and Maud; Vera and Frank; John and Rene; Norman, Win, Beth and Janet; Tony, Ian and Michael; Wendy Ann, Richard and Robert; the staff at Slough; the staff at Uxbridge; Mr and Mrs F. Lawrance; Sister Haynes; Mrs Rees, Miss Tekell and Miss Miles; Sallie Dines; Mrs and Miss Lane; Mrs Jackerman and family; Florrie Clark; Mr and Mrs Russell and Boynton House Ltd; Mr and Mrs P.G. Constable; Mrs Milner; Mrs Evans; Mr and Mrs Stuart; C.A. Roberts; Mrs Steadman and Mrs Foster; Mr and Mrs David Hartley. The ashes are to be taken to Ledbury and placed on Dog-hill, boyhood playground of Mr Suter"
In his early days, Mr Suter was in the drapery business in his native town of Ledbury, Herefordshire, and where he had his own business until coming to Slough. He was one of the few survivors of the trade as it was 60 years ago but despite this, he always adapted himself to the prevailing conditions and modern progress. He was of a retiring disposition, a lover of home and garden and his hobbies were few." By the early part of July the two younger Suter brothers, Frank and John had returned to their families and to the Suters company. Sadly, they returned just in time for their father'' funeral. George William Suter was taken ill during the summer of 1946 and died in the King Edward VII Hospital, Windsor on the 13th July 1946 aged 79. Wendy-Ann Ensor (then aged 12) remembers being taken to visit her grandfather in hospital. The ashes are to be taken to Ledbury and placed on Dog-hill, boyhood playground of Mr Suter. George William Suter's death left the Suters company with a problem. In 1942 he had provided his family with an unwelcome surprise when he marries his housekeeper Bertha Locking and while his will made in February 1945, when opened, was found to give his wife of four years a legacy of one hundred pounds and divide the rest of his estate including his shares equally between his five surviving children. it was, understandably enough, challenged by Bertha and three years passed before a compromise was reached and a house was acquired for Bertha in settlement of her claim. Following George William's death it was found that his will, made in February the year before, divided the residuary estate equally between his five surviving children. Bertha Suter's beneficial interest was limited to a legacy of one hundred pounds. If upheld, the will would secure the stability of the Suters company at least for another generation. However, it was challenged and three years passed before an order from the Probate Court could be obtained. A house was acquired for Bertha in settlement of her claim against the estate. Thus 1946 brought rejoicing at the return to their families of Frank and John Suter but sadness at the loss of their father. Legal problems arising from the will remained for three more years. Nevertheless, the four Suter brothers settled down to plan the future of their company in a post war world. 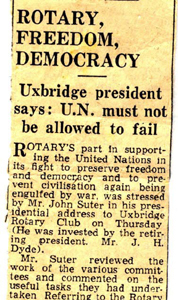 John Suter had been a member of the Uxbridge Rotary Club since 1934 and during 1947 to 48 was Club President. Bobbie Suter was not interested in the all ladies "Inner Wheel Club" which was provided for the wives of Rotarians and had never joined. Nevertheless, she supported John whenever there were Rotary functions. Sadly, John's year as President and the previous year when he was senior Vice President coincided with her pregnancy and the birth and, a few months later, the death of Donald. This meant that she could not go with John to any of the key functions during these years - a great disappointment to him. 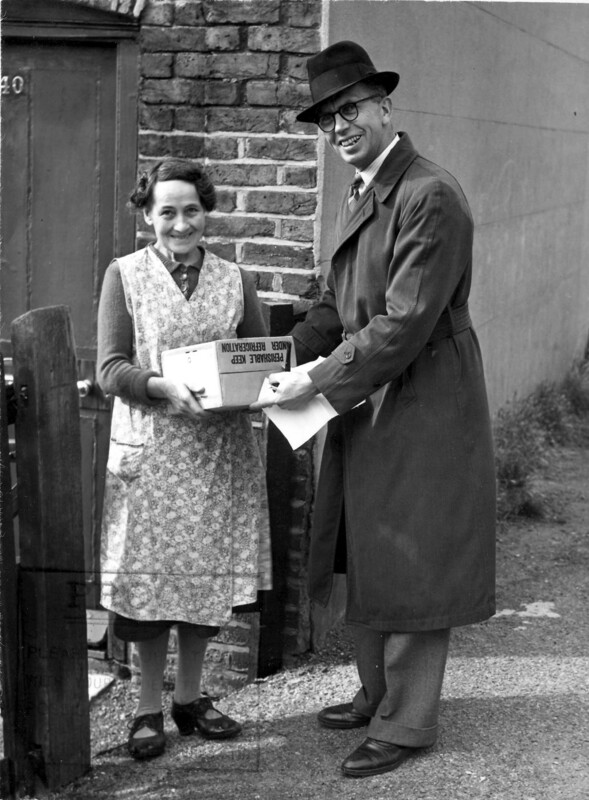 There is a Middlesex Press photo (Above left) of John Suter presenting a box of food - probably supplied by the Rotary Club - to a woman in Uxbridge at about this time. 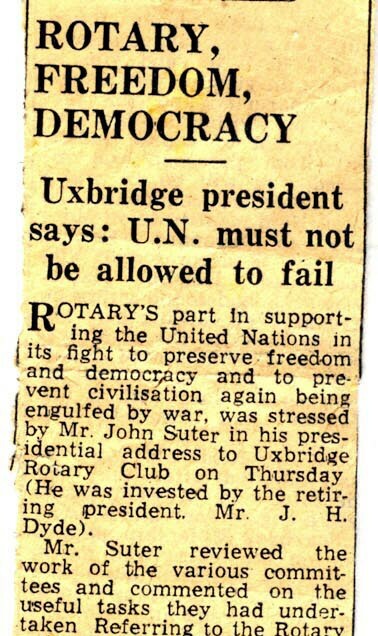 John's presidential address to the Uxbridge Rotary Club in July was reported in the Middlesex Advertiser under the headline "Rotary, Freedom, Democracy"
…… Mr Suter reviewed the work of the various [Rotary] committees and commented on the useful tasks they had undertaken. Referring to the Rotary publications he said that if all Rotarians and the rest of the community could carry out even half the suggestions made in them there would not be the need for the controls to which they were subjected at the present time. "Most controls are placed on us because there were certain individuals who want an exorbitant profit when things are scarce. These people have no sense of decency at all" he said. Speaking of the work of the Community Service Committee there was one aspect of communal life they might study - that of civic responsibilities. "Unfortunately the tone of local government has become political", he added, "and you may remember that the last two by-elections of the local council were run on party lines. It is only a thought on my part but I feel any Rotarian who is willing to serve on the council on a non-party ticket would be doing a great service.."
In view of the recent happenings in world affairs he considered the work of the International Services Committee of the greatest importance. They had learned of the changed conditions in Czechoslovakia where democracy had perished. Few of them seemed to realise the value of freedom of speech, thought and action until they had been taken away. One of the bastions of democracy must be the link up of all the English-speaking nations and those freedom loving peoples of the world still outside the Communist bogy and that bastion must be the United Nations organisation of which he would like to see every nation a member. "Let us cut out all the 'isms' and dictatorships and think only of democracy to develop the four freedoms of the Atlantic Charter", he declared. UN must be supported to the bitter end and must not be allowed to fail as the League of Nations did before 1939. Rotary which was a great international movement, could help as could everyone. …. Even without house hunting 1949 was a busy year for John. During the three years since he returned from the RAF he had taken over, jointly with his brother Frank management of the Suters Uxbridge store. Frank was the General Manager and John, the Assistant but John also had charge of the men's departments at both the Slough and Uxbridge stores. This arrangement suited him as he got on well with all his brothers including Clarence who was manager at Slough as well as company chairman. On most days John divided his time between the two stores. His brother Frank Suter preferred to stay at Uxbridge which was also the main administrative centre. 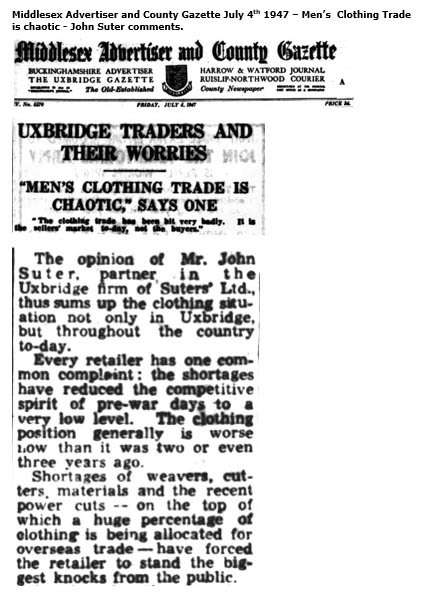 Arthur Suter who had earlier managed the Uxbridge store was company secretary and worked from Uxbridge. Arthur was, also, increasingly involved with local affairs and, in particular, the Uxbridge Council. 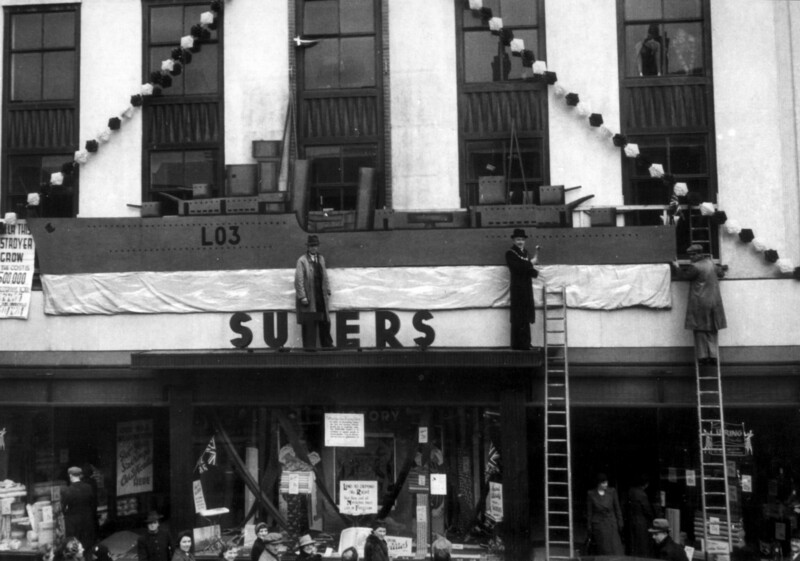 May 1949 marked the 'Silver Jubilee' of the opening of the first Suters shop in Uxbridge and provided an opportunity to stage special events and obtain some free publicity. 'Luxury' goods were in extremely short supply and while clothes rationing ended in mid March there were plenty of items - not particularly 'luxurious' in today's terms which could not be had 'for love or money'. These included curtain materials, fabrics and ladies nylons. 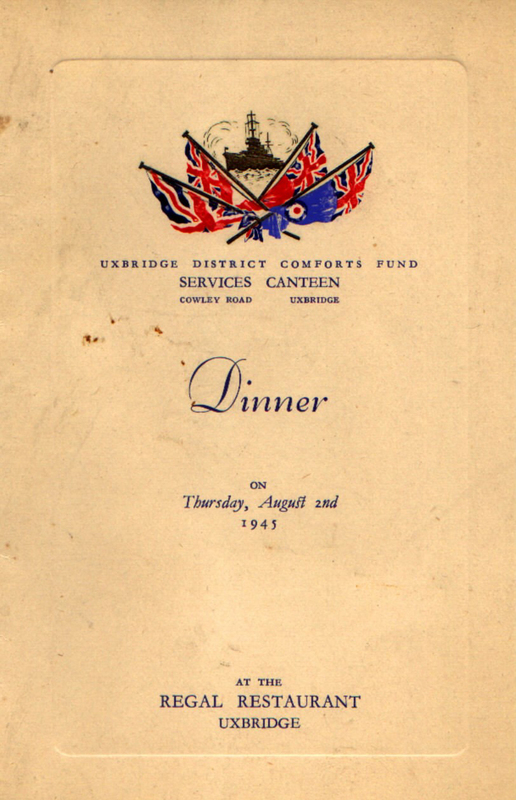 This provided an opportunity for the Uxbridge Directors of Suters who came up with an idea which would both launch their 'Jubilee' and ensure loads of free publicity! Among special displays at the store will be period dresses and a bedroom scene from the set of 'Trottie True' the Two Cities film made at Denham and shortly to be released. Also on show will be a large model electric railway that belonged to the late Dr W Townsend Dobson. Customers will be invited to take part in a display competition. Prizes are to be awarded to the staff with the best displayed counters, and for the customers forecasting the judge's decision there will be three prizes, £10, £5 and £2.10s. 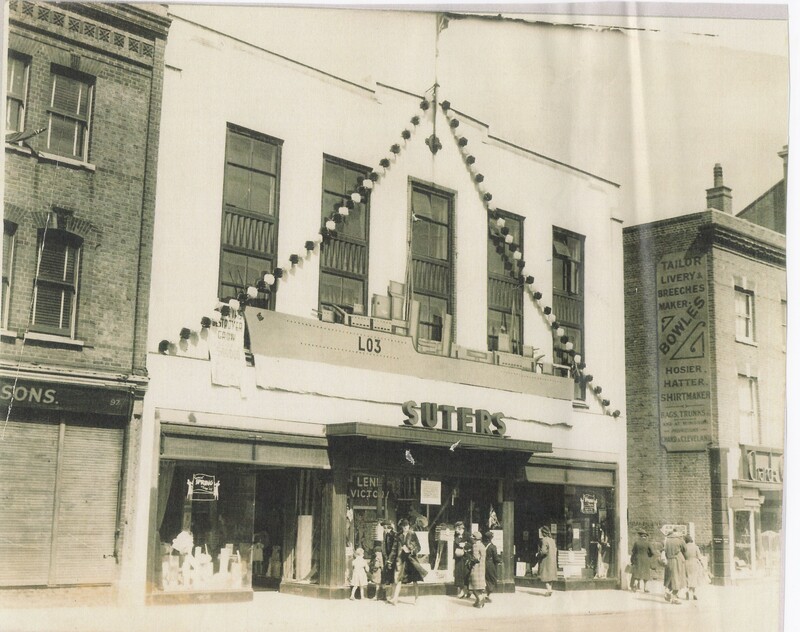 The Middlesex Advertiser reminded its readers of the history of the Suters firm in Uxbridge and the rebuilding of the modern store starting in 1936. The display windows at the rear facing the bus station remained uncompleted on the outbreak of war in 1939 and permission for their installation was still held up because of post war restrictions. The company secretary Uxbridge secretary, Uxbridge Councillor G.A.Suter, gives the secret of the family's success in business: "Personal supervision is our watchword; the directors are always available. And we endeavour to give the best possible quality. Service and courtesy go with it." In the firm's 25 years in Uxbridge, the business has been built up on solid progressive lines. This was all good informative stuff but the real secret weapon in the Suters armoury was launched ever so gently in the headline to the report shown on the next page SILVER JUBILEE NYLONS ! Also in the following week on the 27th May Suters received plenty of publicity. the story exploded into a half page complete with pictures part of which is shown above - WOMEN STARTED QUEUING AT 5 a.m. FOR NYLONS. In more affluent times it is not all that easy to imagine the impact of a press announcement that a local store would have nylon stockings, curtain material and dress fabrics for sale during the following week. In 1949 the effect was dramatic. A queue started forming outside the front entrance to the Suters, Uxbridge store at 5 a.m. and by the time the Middlesex Advertiser woke up and sent its photographer down to have a look it had had to divide into two. One half stretched down the side of the store and out into the bus park at the back and the other spread down the High Street nearly to Belmont Road. By the time the store opened 2,000 women were waiting patiently outside despite heavy rain. The photographer caught part of one queue and then hurried inside to see what was happening. He would have had to explain who he was because there was no question, that week, of simply throwing open the doors. 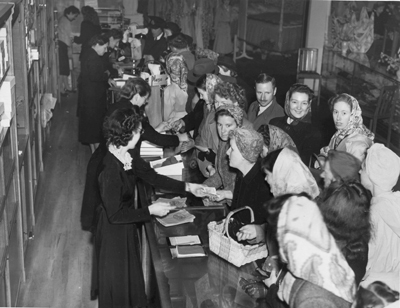 Shoppers, almost exclusively women, were admitted a few at a time and crowded round the counters. Undeterred by heavy rain the bargain hunters continued to arrive in increasing numbers. Every bus which pulled up outside the shop disgorged dozens more women from the outlying areas, who tacked on to the end of the queues. At one time a queue stretched almost to Barclays Bank. Later two queues formed. One extended some way down the High Street and the other much longer with people packed five deep extended round the side of the premises into the bus station. Mrs Phyllis McNamee of Craven Close Hayes arrived at 5.15 to find that she was only number two in the queue for material. Only about one hundred pairs of nylons were on sale each day. Inside the shop, barriers of chairs and screen were uses to keep the people to the counters for which they had queued. Mr F.C.Suter, general manager, told the Advertiser-Gazette; "I thought our plate-glass windows were going to be smashed when we went to open the doors. The rain did not deter the women in the least. 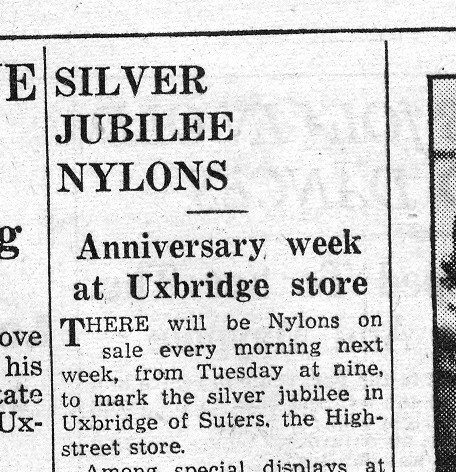 We had to stop the sale of nylons at ten o'clock because we want to sell them every day this week to celebrate our twenty-five years in Uxbridge. On Wednesday morning queues formed again, but were not nearly so big as on the previous day. Trade was brisk and shoppers were able to concentrate on ordinary every day goods. Apart from the reports with photos in the Middlesex Advertiser-Gazette there is good picture, shown on the previous page, of the whole length of the queue stretching down beside the site of the building which eventually became North Thames Gas and the picture opposite - which was chosen for the Advertiser report - of the excited crowd around the nylons counter . There is also a photo of the window display. which looks very tame by comparison. 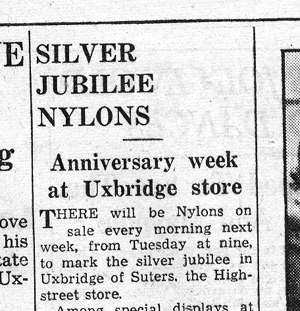 Nylons ensured the Uxbridge Silver Jubilee great success but for Arthur Suter it was only the first and certainly not the biggest event of year. Life in 1948 was not all rationing, conscription and shortages. Two events which added a touch of brightness to many were the London Olympic games and the coming of the 'New Look'. Because of the War there were no Olympic Games in either 1940 or 1944 and as war ended London was 'awarded' the games and given just three years to organise them. The task was completed on time despite the damage to infra structure brought by the war in the London area and the continuing rationing of materials and supplies and severe limitations on total expenditure. 59 countries competed with 4,000 competitors accommodated in the ex RAF Camp in Uxbridge which became 'the Olympic Village'. The Games opened on the 29th July - four days after the end of Bread rationing. It was the school holidays but Wendy-Ann Ensor cannot remember even watching on television despite the fact that the family had a TV set purchased a few months earlier. Bobbie Suter had been so impressed when watching Princess Elizabeth's 1947 wedding on a neighbour's set that she started a quiet campaign to bring one to Eastnor Lodge. Wendy-Ann remembers it arriving. The set had a tiny screen and was greeted with great excitement when it was produced out of a very big box by a young man who set it up in front of the admiring family. John, who was at work, was more than a little surprised when he found it in place on his return from the store. However, he was used to that sort of thing and was persuaded that Bobbie had told him all about it some weeks before! The Olympic Games did not have the same attraction for Bobbie and Wendy-Ann as a Royal Wedding and John's family did not try and buy tickets, or go out to see the Olympic flame pass down Windsor Street in Uxbridge on its way to Wembley or watch the swimming competitors training in the Uxbridge Swimming baths! She does remember visiting the Suters store in Uxbridge while the 'Games' were on and being told by excited assistants that this or that athlete had been in buying something or other. The 'New Look' was quite another matter. 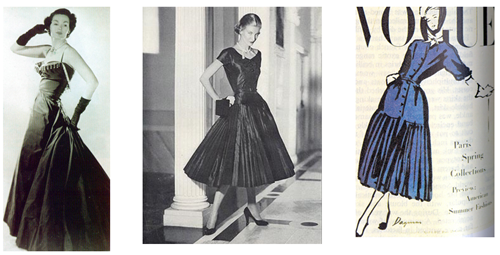 It was in 1947 that Christian Dior introduced his 'Corolle' collection which was eventually dubbed the 'New Look' by the American Press. As presented by Dior the main characteristics of the collection were tiny waists, swirling skirts and for the evening a suggestion of a bustle. There were long dresses for evening and shorter skirts for day but they all required much more material than had been available during the war and brought a return to traditional feminine lines. While a return to feminine glamour appealed to Bobbie the thought that New Look styles might spread to London caused a chorus of disapproval as soon as it was known how much material would be used up when copying one of Dior's creations. It was said that an evening dress would require 30 or 40 metres of material plus a corset which was still firmly classified by the Board of Trade as a 'luxury garment'. There were indignant questions asked in Parliament and the Government was rumoured to be considering legislating against the new skirt length. Sir Stafford Cripps - President of the Board of Trade - made an appeal for moderation. The following year in 1948 Cripps' successor at the Board of Trade, Harold Wilson, declared, with his wife Mary in the background: "I have my own private views on that matter …… [but] at this present time, with the shortage of materials and of manpower, most people would agree that it doesn't make sense to have skirts longer". Despite both Cripps and Wilson by mid 1948 Bobbie had a New Look day dress though no photo survives. There is a photo taken of an evening function in about 1948 which shows Bobbie with Jean Creighton and Mrs Wade all in long dresses with fairly pinched in waists which owe something to the New Look. Bobbie's dress even has the "extravagance" of matching detached sleeves which would have added to the material needed but she was never much of an enthusiast for either Sir Stafford Cripps ideas of 'austerity' or for that matter, Harold Wilson. Clothes continued to be 'rationed' until March 1949. 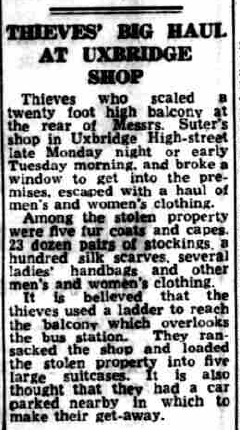 The Uxbridge Advertiser and Gazette of Friday 16th 1949 reported that Thieves' Big Haul at Uxbridge Shop - Thieves who scaled a twenty foot high balcony at the rear of Messrs Suter's shop in Uxbridge High Street late Monday night or early Tuesday morning, and broke a window to get into the premises, escaped with a haul of men's and women's clothing. Among the stolen property were five fur coats and capes. 23 dozen pairs of stockings, a hundred silk scarves, several ladies' handbags and other men's and women's clothing. It is believed that the thieves used a ladder to reach the balcony which overlooks the bus station. They ramsacked the shop and loaded the stolen property into five large suitcases. It is also thought that they had a car parked nearby in which to make their get-away. 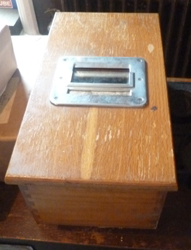 Left - an example of an old till that would have been used by Suters in the 1940s and 1950s. 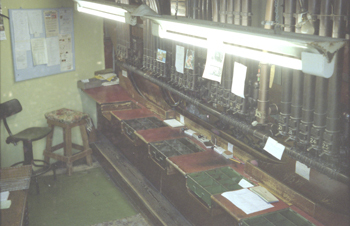 This example is on display at the historic Bletchley Park Post Office. The Uxbridge store would also have had the Lamson Paragon system of metal containers being sent along a netweork of tubes to a central cash office. When the Suters in Slough was re-built in the 1960s a similar, but modern system was also installed.